I truly don't know if I could be happier with the product I received from Mwb Studios. I had spent hours on the internet, searching for something I could use as a cufflink box to surprise my fiancé on our wedding day with the cufflinks of his late grandfather. I knew I wanted something that paid tribute to our wedding on the outside and paid tribute to his grandfather on the inside, but I was totally unsuccessful in finding anything remotely similar until I came across this ring box. Michael worked with me so easily by accommodating the ideas I pitched to him, and even contacted me during the process to suggest something that helped the outside of the box look much better. What really finished the experience was how the box (quickly, even) arrived to me: wrapped so carefully in tissue paper and surrounded by foam to protect it. And it was absolutely beautiful! I truly appreciate the amount of care and professionalism that went into helping me make something special for my future husband and preserve something that means so much to him. A tremendous thank you to Mwb Studio! I would recommend in a heartbeat. This is the first of a series of female art deco wall clocks I am putting together. 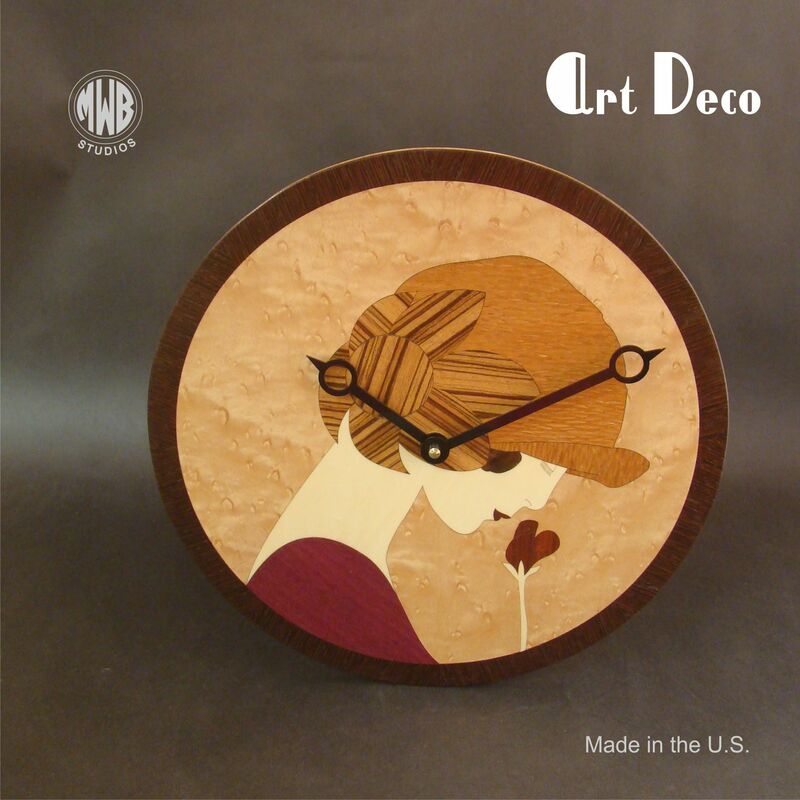 This clock is put together using the age old art of marquetry or inlay. Each clock is 12" in diameter and 1/4" thick. It comes with a battery operated quartz movement. (battery not included). Each clock can also be personalized if desired, just let me know what you have in mind and we can work together to get the end results. This particular clock is covered with lacewood, padauk, purpleheart, holly, zebra wood, walnut burl and the back ground is figured maple and the border is wenge. The hands are made of bass wood. Assembly of the hands is required. We send two sets of hands and easy to follow instructions on how to attache the hands. I do ship overseas to several countries. Please contact me and let me know where you are and I will calculate a shipping cost for you. Please see my shipping and policy section. My items are priced for the American market so any overseas sales do not include any duties. Because we are dealing with wood and grain structures, each clock will vary slightly because of the wood grain. Working with Michael was a joy. I had 3 communications with him, and each time he responded within an hour or two at the most, each time telling me exactly what I needed to know. The clock was shipped immediately and received before expected. It exceeded my expectations and I absolutely love it. It is so unique and the woods are spectacular. I have not seen another like it. Thank you, Michael, for a wonderful experience and a beautiful work of art. Michael has made an absolutely stunning piece of art in this clock. I can't wait to see more of these "lady" clocks in the future.